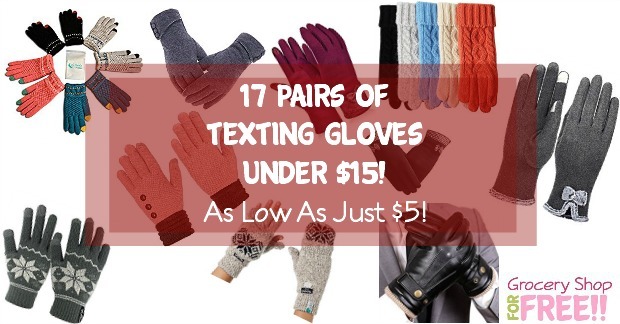 17 Pairs Of Texting Gloves Under $15! As Low As Just $5! You are here: Home / Great Deals / Amazon Deals / 17 Pairs Of Texting Gloves Under $15! As Low As Just $5! 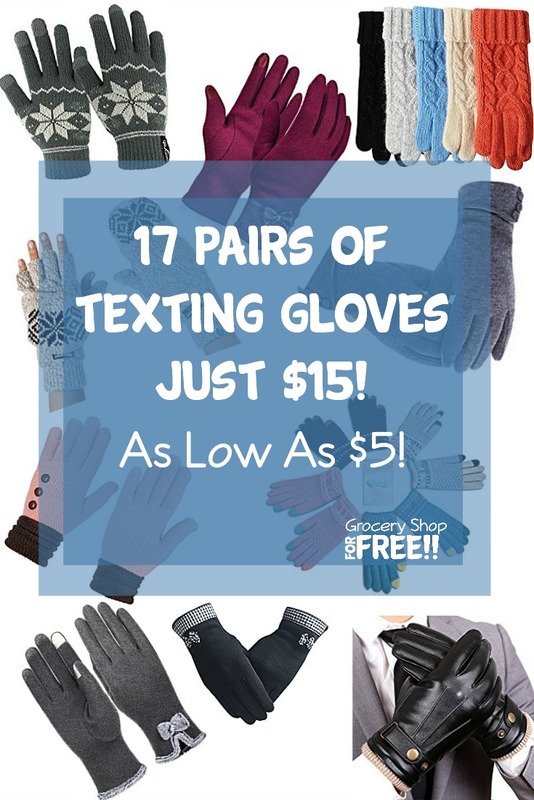 These 17 Pairs Of Texting Gloves Under $15 would be an awesome gift for yourself or someone on your gift list! A few years ago I got a gift card from my son for Christmas to JCPenney for clothes. I had lost over 100 lbs and seriously had no clothes! lol I was thrilled and really enjoyed trying on the new smaller clothes. Well, I had a few dollars left and didn’t know what else to get – the gift card went a long way with coupons and after Christmas sales. I saw these texting gloves that were too cute! So, I grabbed them not thinking much about them. I will say now, though – that during the cold months I am SO happy I bought those! They work great! I never leave the house without them! They live in my purse! I thought I would share some deals on texting gloves for you in case you needed some or wanted to gift them to someone else! There are tons of different kids now. Mine have the tips of my fingers exposed, but, also have a “mitten” cover so I can cover the tips when I need to. Check these out and see if any of these strike your fancy! It’s Ridic! Warm touchscreen / texting winter gloves – $8.49 Comes in 14 color choices! Touch Screen, Smartphone, iPhone, iPad, androids, GPS, etc. ELMA Women’s Touchscreen Wool Knit Gloves – $14.99 Comes in 11 color choices! Touchscreen feature makes many acts easier and particularly faster. Aspen Supply Adult Stretchy Texting Gloves – $5 – Comes in 13 color choices! Makes a great gift! Index finger and thumb fabric make texting while wearing gloves possible. Soft and warm. Great for moderate winter use. Great spare gloves for cool days. One size fits most adults & teens. Gellwhu Touch Screen Winter Outdoor Warm Knit Gloves – 4 Pack – 13.99 – This is a great deal – you get 4 pairs! Touchscreen technology on THUMB & INDEX finger tips for easy smartphone and tablet use in the cold weather. Fleece Lining is a good warm fabric,skin feel very comfortable and very soft. Three buttons decoration,it comes out looking elegant. Touch screen design,keep warm in cold weather. Great for winter,driving,or just to fit your style. Shipping from USA,The Standard Shipping Time is about 3-5 Business Days. Size: one size, fit most people. good elastic. These gloves will make your hands warm while you’re enjoying your time with your favorite touch screen device.Works with all touch screen type devices. Classy and elegant button decorated texting gloves with ruched wrist finish. Made of high-quality non-inverted velvet with velvet lining. Works with all touch screen type devices including iPhones, iPads, Android phones, etc. Leather pattern on the cuff and more colors available, fashionable and special. Delicate sewing workmanship, durable in use. 100% Finest and High Quality Acrylic and Warm Wool Lining Material. LETHMIK Men’s Solid Magic Knit Gloves Winter Wool Lined with Touchscreen Fingers; Item Weight:0.11 LB , very soft and comfortable winter warm knit gloves, there are two Solid colors for you to choose. Hand Wash or Spot Clean Recommended! Please Try Not to Machine Wash or Brush Wash (In order to avoid Pilling). SOLID COLOR AND WARM WOOL LINED – The Classic Plain color Knitted, Build a simple and stylish Knit Construction style, super soft and warm wool lining design, it will be very suitable for Fall and cold Winter, provides you with Warmth, Comfort and Softness. It’s an excellent choice for Gifts or Your Own Dressing. Buy more for your friends and family. SMART TOUCH GLOVES ~ You’ll LOVE the luxurious, soft feel of this premium material and brushed interior. SMARTPHONE GLOVES ~ Buy a couple pairs now! Everyone in the family gets cold outside, but who can let their phone go? You’ve got ’em covered. WINTER TOUCHSCREEN GLOVES ~ Our latest “Touch-nology” is all wrapped up in your fingertips for smart, fun, warm smarphone love oudoors. 100% Winter-Smart “Wear-antee”! Don’t LOVE our iPhone Gloves for any reason at all? Just let us know for a FULL Refund. Your Satisfaction is our #1 Priority! I have some like these and I LOVE them! Material:95% Polar fleece,5% Spandex, conducting material. Size:L–Palm wide 4.3 in,Full length 9.5 in. M–Palm wide 4.1 in,Full length 9.1 in. Please allow little color difference due to different camera or light environment. If you have any question, please contact us! Considerately design with touch-screen function. Lace pattern on the cuff, enhancing the elegant fashion. Delicate sewing craft, creating a high-quality product.